Kristopher Stenson is the administrator for the Oregon Records Management Solution at the Oregon State Archives, where he works with state and local government agencies to proactively manage their electronic records securely and efficiently in a centralized ERM environment. He previously worked as the electronic records archivist for the Illinois State Archives. Stenson holds an MLS from Indiana University and an MA in History from Washington State University. 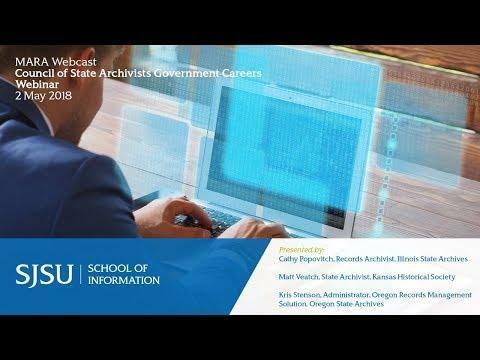 Join members of the Council of State Archivists to hear about exciting and varied experiences in careers as government archivists and records managers. Guest speakers include the director of the Kansas State Archives; an Illinois archivist who writes and edits state archives publications, manages grants, and is a records board deputy coordinator; and an archivist who works in proactive, secure, and efficient management of electronic records in Oregon.